These are .40 caliber in size and made of high tensile aluminum. They are the real deal and produce amazing velocity. 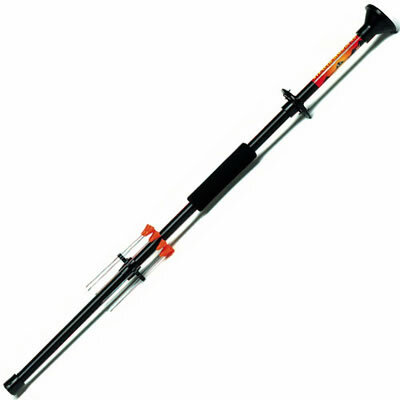 A blowgun consists of two parts: a long, hollow tube and a projectile. The hole in the tube is narrow enough so as to allow some sort of projectile or dart to be inserted and for air to be blown through. It may be made with materials such as wood, bamboo, plastic or even steel. 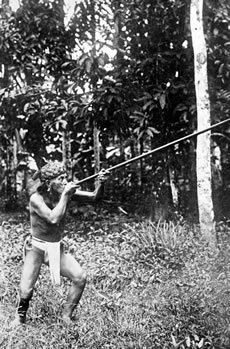 Many people are finding that blowguns offer a challenging (though easily mastered) and fun sport. With the introduction of paintballs and stun darts, they offer a wide variety of excitement. These are .40 caliber in size and made of high tensile aluminum. They are the real deal and produce amazing velocity. You can expect ranges over 200 feet and muzzle velocities as high as 350 feet per second. Each blowgun comes with 8 target darts, mouthpiece, muzzle guard, foam grip and a dart quiver to carry ammo on the tube. Warning: Will cause extreme fun at backyard BBQ's! Shoots these accessories: target darts, stun darts and paintballs. The longer the blow tube, the further and faster it will go! Excellent for camping. An activity the whole family will love! These could be used for hunting in a survival situation. An 18-inch model fits nicely on the top, bottom or side of your pack. As a backyard activity, this is loads of fun and easy to master! The whole family can enjoy and your kids will learn a valuable skill in both aiming and judging the strength of their breath to hit the target accurately. Makes a fun competition. Over 40,000 years ago, the first tube shooters began to appear in many different parts of the world. Although crude, these primitive weapons were extremely accurate. They are still used today for hunting by Amazonian Indians in South America, and by Pygmies in Africa. They were also used by the Ninja prior to 1500 in Japan for silent assassination with poison darts. It is not known exactly where blow guns originated, however, it is generally believed that they appeared simultaneously in many parts of the world. Back then, they were made from bamboo or other hollowed out woods. Today's modern man uses one with tranquilizer darts to help maintain today's wildlife. Herpetologists find them extremely useful in capturing elusive lizards with stun darts. The blowgun is a simple but effective weapon for firing a light projectile through a narrow tube using the force exerted from one's breath. The power is only limited by the lung capacity of the user. Many cultures throughout history have made use of this weapon, most notably the indigenous peoples of South and Central America, as well as the peoples of South East Asia and Africa. The Cherokee and other Indians of America also made use of the blowgun at an early period. Various projectiles, such as seeds, pellets, and darts were fired at short range to bring down small game such as birds, lizards, monkeys, and squirrels or rabbits. In South America, the darts were sometimes tipped with curare, a potent poison attacking the nervous system, inducing paralysis. Curare allowed them to hunt bigger and more formidable game such as jaguars. In South East Asia, bands of modern hunters equipped only with blowguns are known to stalk and bring down wild tigers. Today, they are often used in the same way, but with modern tranquilizer drugs to bring down and capture even large, dangerous animals. Use of blowguns dates back perhaps 40,000 years to the dawn of history. These weapons are pictured on pre-Columbian pottery of the Americas. Among the ancient Mayans it was a common weapon, carried for long distances to hunt food for travel, along with a bag of small clay pellets polished smooth to better pass through the tube. Blowguns are traditionally made of any hard, hollow growth, such as river cane in the Americas and bamboo in Asia. Darts might be made of hardwoods or animal bone, with tufts of down, feathers, or fur serving as the fletching. In other areas, the tubes were often made of curved, polished hardwoods glued and bound together to provide a durable tube. Modern versions are made from a variety of materials such as plastics, fiberglass, and aluminum. The ultimate hunter's weapon, blowguns are potentially deadly, silent weapons. But with limited range compared to a gun, they require great stealth to use in the wild. Yet they are a simple weapon which anyone can use without special training. Mastering this weapon to fire the projectile with real force and accuracy only takes a little practice. Though they can still be used for hunting where legal, today they are more of a recreational weapon. Often they will be used to fire small paint pellets marking the target, as well as traditional darts. Competitions involving the blowgun are held around the world as this simple but affordable hunting tool maintains a high popularity. Sport competition is managed by the International Fukiyado Association out of Japan, where blowguns were once a favored weapon of the legendary ninjas. It has affiliate organizations in many countries such as the U.S., Germany, France, and the Philippines. Standards of competition require both tubes and darts be of a fixed length and caliber, shooting from various ranges but usually a 10-meter distance. It is hoped that this type of shooting will one day become an Olympic event. In Japanese competition, the darts are made of a cellophane plastic rolled into a cone shape to propel a brass dart. But in Japan, the Fukiyado Association has privatized the sport so that all products and materials are controlled by them. Tournament blowguns must be 120 cm long with a diameter of 13 mm, and the dart 20 cm long and weighing .8 grams, with no mouthpiece allowed. Another influential organization is the Cherokee Annual Gathering Blowgun Competition. It sponsors and hosts a more rigorous competition that is more like a biathlon. Participants move on foot through a course of set targets, firing and retrieving darts, until reaching a final target which must be struck from a 20-meter distance and the target 24 centimeters in diameter. Scoring is based on speed and accuracy, but shooters advancing to the next round must move back an additional two yards. In Cherokee competition, depending on the event held, the gun is usually hardwood such as oak or ash, and 6 to 9 feet long, with a dart 6 to 22 inches, fletched with bull-thistle or rabbit fur. In other U.S. and European competitions, blowguns are usually .40 caliber diameter and limited to 4 feet in length. Mouthpieces are allowed, with varying restrictions as to dart weight and length. 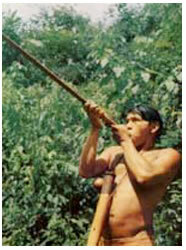 The jakaltec style of Central America calls for a wooden blowgun about 1.3 meters long with a sight placed 30cm from the end. Elsewhere, stainless steel or aluminum darts are common, while simple piano wire is often used. Various manufacturers provide darts of anywhere between .35 and .75 caliber. Use of even larger models are often sold or hand-made where hunting is still legal. Darts can be made from hardwood or bamboo skewers, nails, or pieces of wire coat hanger, and affixed with knots of thread or fishing line to serve as the dart fletching. Given the silent, deadly nature of blowguns when combined with modern chemicals, they are now restricted in many areas, such as California and Massachusetts in the U.S., and are now illegal in countries like Guatemala where they traditionally originated. They are also illegal for use in Canada and some European nations. But where they are still regarded as a sporting or legal hunting weapon, blowguns are a fun, challenging, yet very affordable pastime. With the right ammunition, they can provide hours of safe and challenging entertainment for children in the backyard, helping them develop useful skills and discipline - along with stronger lungs. Many people are catching on to the excitement of this ancient weapon which can be both a fun toy and a valuable tool even today. 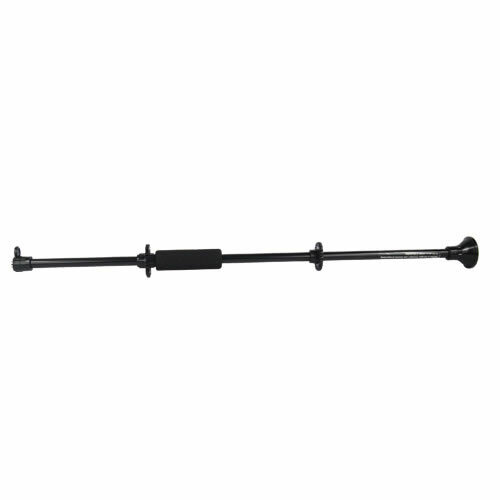 This blowgun is an ideal starter choice, designed to the U.S. standard .40 caliber size and made from a durable, high-tensile aluminum tube. With a minimum of practice it's capable of firing darts with a muzzle velocity as high as 350 feet per second, and striking small targets from 200 feet away. Each gun comes with 8 target darts carried securely on the affixed quiver, comfortable foam grip, mouthpiece, and muzzle guard. The model featured here is a handy 18-inch length, which could serve as an essential item for the survivalist or dedicated outdoorsman. It's a great introduction to an exciting yet economical hobby which can be practiced right in your own backyard, anytime you like. All it requires is a blowgun target and a deep breath...! This blowgun is fantastic. Bought it for a friend for Christmas and he absolutely loved it. I got the 18 inch, and I thought it would look cheap since it's only $8.95. I thought wrong. Great quality, and the darts are extremely sharp.